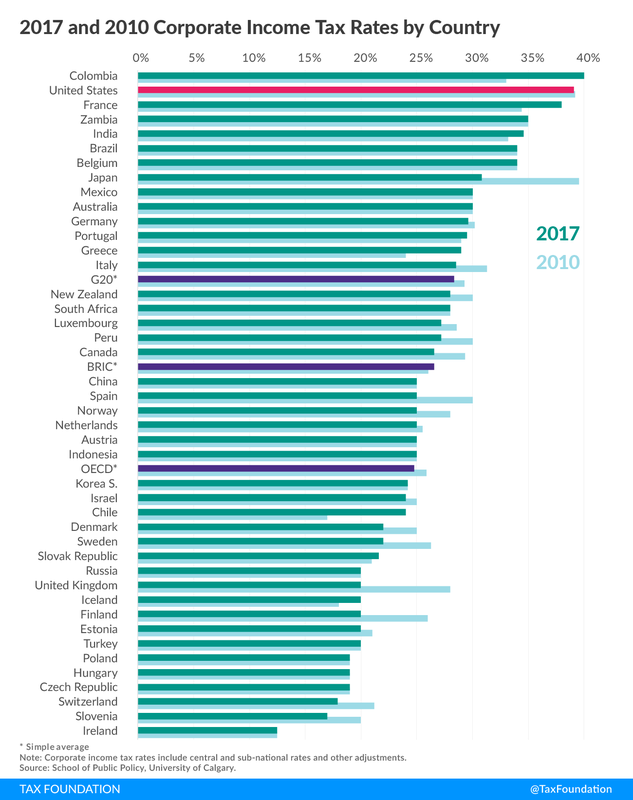 Among 43 nations surveyed, the United States has the second highest statutory corporate income tax rate at 39.1 percent and is one of the few nations that has not reduced its statutory tax in the past seven years. The U.S. tax burden on new investment, the marginal effective tax rate (METR), is fifth highest among the 43 nations at 34.8 percent. If bonus depreciation were made permanent the METR would be 27.3 percent. The average METR among developed nations is 19.2 percent. Both the House GOP and President Trump have proposals that would greatly improve the competitiveness of the U.S. tax system by reforming the corporate income tax. The House GOP proposal to convert the corporate income tax into a “destination-based cash-flow tax” would reduce the corporate income tax rate to 20 percent and the METR on new investment to 16.1 percent. A proposal similar to that put forth by the Trump administration would reduce the statutory corporate tax rate to 15 percent and the METR on new investment in the United States to 21.4 percent. As residents of the United States’ northern neighbor, Canada, we watch with great interest the unfolding debate in the United States with respect to business tax reform. Since 2000, Canada achieved a much more competitive business tax structure by lowering corporate income tax rates from roughly 43 to 27 percent, broadening the corporate tax base to make it more neutral among business activities, eliminating a capital tax on nonfinancial companies, and reforming sales taxes that removed most sales taxes on capital purchases. From having the highest tax burden on new investments in 1999 among industrialized countries, Canada moved to the middle of the pack by 2012. The reform led to more investment and better growth in both GDP and national income without a significant loss in corporate income tax revenue as businesses found it more attractive to keep profits in Canada. The United States is looking at major business tax reform packages that could boost growth and make it more attractive to keep profits in the United States. In this paper, we specifically model the impact of a variation of two business tax reforms: the House GOP Blueprint Plan promoted by Speaker Paul Ryan, and Plan B, which has a simpler approach. The House GOP Blueprint plan proposes a major revamp of the business tax system by converting the corporate income tax into a “destination-based cash-flow tax”. The federal corporate income tax rate would be lowered from 35 to 20 percent. Noncorporate business income would be taxed at a rate of 25 percent. Tangible and intangible capital expenditures would be generally expensed (associated net interest would not be deductible). Border adjustments would be introduced that would exempt export revenues from tax and disallow the deduction for imports cost. Investment income (dividends, capital gains, and interest) would be half taxable at the personal level. In other terms, the House GOP Blueprint equivalently abolishes the corporate income tax (which is partly a production tax) in favor of a subtraction-method value-added tax (VAT) on consumption with a negative payroll tax or wage credit for labor costs (labor compensation is deducted from the cash-flow tax base). The economic effect would be to make the U.S. tax structure much more competitive compared to the existing business tax structure and thereby boost growth. However, the House GOP plan is not without controversy. The border adjustments, similar to any destination-based VAT, would result in higher taxes on products sold in the United States while removing taxes on exporters. The elimination of net interest deductions incurred in the financing of tangible and intangible capital expenditures would affect most heavily leveraged companies. Financial companies with net interest income would be exempt unless financial firms are taxed otherwise. Transition issues with respect to the tax treatment of old capital and debt would need to be considered as well as the division between a cash-flow treatment of business income and a regular income tax approach to investment earnings and capital gains. Perhaps, a more straightforward plan – called Plan B in this paper – is to lower corporate income tax rates to a federal rate of 15 percent and undertake sufficient base broadening to make up for any revenue losses beyond dynamic scoring to account for a bigger profit base. For example, tax could be imposed on both remitted and retained foreign profits of U.S. companies at a relatively low rate (with a credit for earning brought home) that would not impact on the tax burden for domestic investments. Looking at both versions of these plans (even in the absence of border adjustments), this paper will show that the U.S. effective tax rate on new investments would dramatically fall due to lower corporate income tax rates and capital expensing. While the United States currently has one of the highest effective tax rates on capital among industrialized and emerging economies, both the House GOP Blueprint plan and Plan B would put the United States closer to the middle of the pack. This brief study begins with a comparison of the existing U.S. corporate tax burdens on new investments in comparison with 43 other countries for manufacturing and services. It then turns to an analysis of the House GOP plan and Plan B in their impact on U.S. tax competitiveness. When comparing tax burdens on capital across countries, it is not sufficient to focus on corporate income taxes only (both tax rates and treatment of costs, such as depreciation and inventory costs). Many countries impose other taxes on capital, such as Japan’s tax on fixed assets or India’s tax on profit distributions to residents and nonresident owners. Several countries have stamp duties or transfer taxes on financial and real estate transactions (such as Australia and China). Others impose sales taxes on capital purchases, such as those under U.S. state retail sales taxes, which are quite significant in their impact. To account for these differences in tax systems, an analytical measure is developed to account for the various taxes borne by businesses on their new investments. This measure is the marginal effective tax rate (METR), which is the annualized value of corporate taxes paid as a percentage of the pretax profitability of marginal investments. Marginal investments are those that are incremental to the economy: they earn sufficient profit to be taxable, to attract financing from investors, and to cover risk. At the margin, businesses invest in capital until the rate of return on capital, net of taxes and risk, is equal to the cost of financing capital (their interest rate). If the rate of return is more (less) than financing costs, firms will invest more (less) in capital. Thus, if a government increases the tax burden or wedge between gross and net returns, it will result in businesses rejecting marginal projects that would otherwise be profitable if the tax burden were smaller. This paper includes taxes that impinge on capital investment, including corporate income taxes, sales taxes on capital purchases, asset-based taxes (capital taxes and property taxes), profit distribution taxes, and transfer taxes on real estate and financial transactions for manufacturing and service sectors (services include construction, utilities, transportation, trade, and other business and household services). In the analysis, most taxes are included; however, municipal property taxes are excluded, as they are difficult to measure due to variation in municipal rates, exemptions, and bases and cannot be compiled by industry sector. How does the U.S. stand currently? In 2017, the United States has the second highest corporate income tax at 39.1 percent, just below Colombia’s 40 percent (Figure 1). Among OECD countries only, the U.S. statutory corporate income tax rate is the highest. A high corporate income tax rate not only results in a higher tax burden on investment but also encourages both U.S. and foreign-controlled companies to shift costs into the United States, thereby reducing potential revenue for federal and state governments. For these two reasons – growth and revenue concerns – many fiscally challenged governments have reduced corporate income tax rates and/or broadened tax bases or increased reliance on other business taxes even after the 2008 financial crisis. Since 2010, the average OECD corporate income tax rate has fallen by more than 1 percentage point, with the biggest reductions in Japan (8.5 points), Spain (5 points), Finland (6 points), and the United Kingdom (10 points). Figure 2 provides a ranking of effective tax rates on new investments (METRs) for the 43 countries, from highest to lowest tax burdens (the Appendix provides results for manufacturing and service companies). The U.S. tax burden on new investments is fifth highest at 34.8 percent. (If bonus depreciation were permanent rather than being phased out, the METR in the United States would be 27.3 percent, eighth highest among the 43 countries.) Since 2010, the tax burden on new investments has particularly declined in Finland, Japan, and the United Kingdom due to corporate rate reductions, and in Italy, which provides a substantial allowance for the cost of increased equity financing. Figure 3 provides a breakdown of the impact of different taxes on METRs by country. 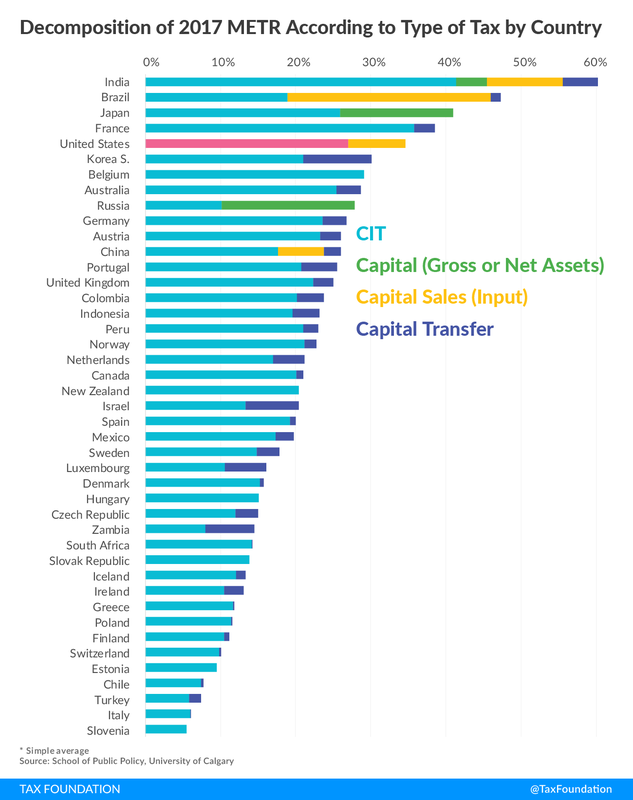 In the case of the United States, the retail sales tax imposes a significant burden on capital, while sales, capital, and transfer taxes increase effective tax rates on capital quite sharply in Brazil, India, and Japan. For example, Brazil would have a lower METR than the United States if not for Brazil’s nonrefundable VAT on capital. Japan would also have a lower effective tax rate on new investments if not for its tax on fixed assets. India has announced moving ahead with its VAT reform that will reduce significant sales taxes on capital purchases (not shown in the graph). The corporate income tax rate is high, as shown above, discouraging investment. Despite its high corporate income tax rates, the U.S. also collects a surprisingly low amount of corporate income tax at only 2 percent of GDP (2010-15 average), in contrast to OECD countries collecting 2.9 percent of GDP with an average corporate income tax rate of 25 percent. Various incentives are given for specific activities undermining productive efficiency by encouraging investments in some business activities and not others. As a result, the corporate income tax is one of the most economically costly revenue sources to fund public services. The high statutory corporate tax rate encourages U.S. multinationals to shift profits to foreign jurisdictions, with one estimate suggesting a cost of $100 billion per year. Corporate taxes fall most heavily on internationally immobile factors of production (land and labor) either through lower negotiated wages or higher consumer prices, reducing the purchasing power of income earned by internationally immobile factors of production. It is not surprising that both Democratic and Republican parties have had various tax reform proposals to lower corporate income tax rates and broaden tax bases in the past several years. With the election of Donald Trump as president in November and Republican control of the Senate and House of Representatives, a renewed focus has been placed on business tax reform, including corporate and noncorporate forms. We model two variations of proposals made in the United States. The first is two variations of the House GOP Blueprint, with a 20 percent federal corporate income tax rate on both manufacturing and service industries. We assume expensing of capital limited to structures and machinery (House GOP Plan 1) or full expensing for tangible and intangible capital (House GOP Plan 2). In both cases, we assume that the state income taxes remain the same and deductible against the federal tax base as well as other taxes on capital, including the retail sales tax on capital purchases. Interest expense incurred to finance capital is assumed not to be deductible in both cases. In Plan B, we assume a federal corporate income tax rate of 15 percent with expensing limited to manufacturing (no interest deductions are incurred if expensing is elected). The loss in revenue is made up by taxation of multinational foreign profits as originally proposed by President Trump during the election campaign (this base-broadening measure would not affect the domestic effective tax rate on new investments in the United States). Table 1 provides effective tax rates on new investments under both the House GOP Plans and Plan B. The House GOP Plan under full expensing has the largest impact on the effective tax rates. Even taking as a starting point the case of bonus depreciation under the current system, the METR declines from 27.3 percent to 16.1 percent for House GOP Plan 2. The remaining 16.1 percent tax burden is associated with state corporate income taxes and the retail sales tax. The METR on manufacturing drops by more than a half, from 25.4 percent to 11.1 percent. If bonus depreciation is ignored due to its temporary status, the reductions in effective tax rates on new investments are even more dramatic. Under the House GOP Plan, the United States would have a much more competitive corporate tax system; its major competitors would no longer have a distinct tax advantage over U.S. domestic investments. The two NAFTA partners that have so long pursued a business tax advantage would lose it altogether except for manufacturing in Canada and services in Mexico that would face tax rates roughly comparable to their U.S. counterparts. If expensing is limited to only depreciable assets, the METR (House GOP Plan 1) drops less dramatically to 18.4 percent (manufacturing) and 23.9 percent (services), for an aggregate drop of 21.9%. From tax levels without bonus depreciation, the METR falls by more than a third, from 34.6 to 21.9 percent. Under Plan B, the reduction in the METR is not as dramatic as with House GOP Plan 2. Starting with bonus depreciation, the METR drops by a fifth, from 27.3 percent to 21.4 percent. Ignoring temporary bonus depreciation, the METR declines more dramatically, by more than a third. While corporate tax rate reductions have a significant impact on competitiveness, the expensing proposals add much more grease to make the wheels turn in the U.S. economy. House GOP Plan 2 would result in the largest increase in capital stock and growth in the United States. It would also minimize variations in effective tax rates on manufacturing and service activities. Without a doubt, proposals for corporate income tax reform in the United States would raise investment and growth rates, especially when corporate rate reductions are combined with expensing broadly applied to assets. While other aspects of the U.S. tax system impact on investments, especially retail sales taxes at the state level, the proposed U.S. tax reforms would change the international game quite dramatically. Even without border adjustments, the U.S. would require many other countries to reconsider their tax burdens on capital investments. This need not be a negative result if the world economy is ultimately jolted to better economic performance, leaving behind a decade of low growth as a “new normal”. For a review of the impact of business tax reform in Canada, see D. Chen and J. Mintz, “2012 Global Tax Competitiveness Ranking: A Good News Canadian Story,” SPP Research Papers, 5(28), School of Public Policy, University of Calgary, 2012, and P. Bazel and J. Mintz, “2015 Tax Competitiveness Report: Canada is Losing its Attractiveness,” SPP Research Papers, 9(37), School of Public Policy, University of Calgary, 2016. For a good exposition of the various issues, see A. Auerbach, M. P. Devereux, M. Keen, and J. Vella, “Destination-Based Cash Flow Taxation,” WP 17/01, Oxford University Centre for Business Taxation, January 2017. See also G. Haufbauer and Z. (L.) Lu, “Border Tax Adjustments: Assessing Risks and Rewards,” Policy Brief, Peterson Institute for International Economics, January 2017. The U.S dollar would appreciate, offsetting some or all of the impact of taxes on imports as well as benefits to exporters. Some have argued that the U.S. dollar would not rise by as much as the tax given that some goods and services might be exempt, such as financial services, and because various countries have inflexible exchange rates, some fixed with the U.S. dollar (B. Lockwood, D. de Meza and G. D. Myles, “When are Origin and Destination Regimes Equivalent?, International Tax and Public Finance, 1(1), 1994, 5-24). The exchange rate adjustment is not critical to the point that the adoption of the House GOP plan would have a major impact on U.S. competitiveness by reducing taxes on new investments. An earlier version of the analysis is contained in J. Mintz, P. Bazel, Daria Crisan, and D. Chen, “With global company tax reform in the air, will Australia finally respond?” Minerals Council of Australia, March 2017. The OECD is the Organization for Economic Cooperation and Development, a group of 35 leading developed nations. BRIC stands for Brazil, Russia, India, and China, four large emerging national economies. Much work is needed to analyze taxes in these sectors, so international comparisons have been more limited. For some international resource tax comparisons, see J. Mintz and D. Chen, “Capturing Economic Rents from Resources through Royalties and Taxes,” University of Calgary School of Public Policy Research Paper 5, 30 (2012); and D. Crisan and J. Mintz, “Alberta’s New Royalty Regime is a Step Towards Competitiveness: A 2016 Update,” University of Calgary School of Public Policy Research Paper 9, 35 (October 2016). For finance companies, taking into account nonrefundable VAT on capital purchases, see Jack Mintz and Angelo Nikolakakis, “Tax Policy Options for Promoting Economic Growth and Job Creation by Leveraging a Strong Financial Services Sector,” Toronto: Financial Services Alliance, December 2015. The G7 consists of the United States, Japan, the United Kingdom, France, Germany, Italy, and Canada. 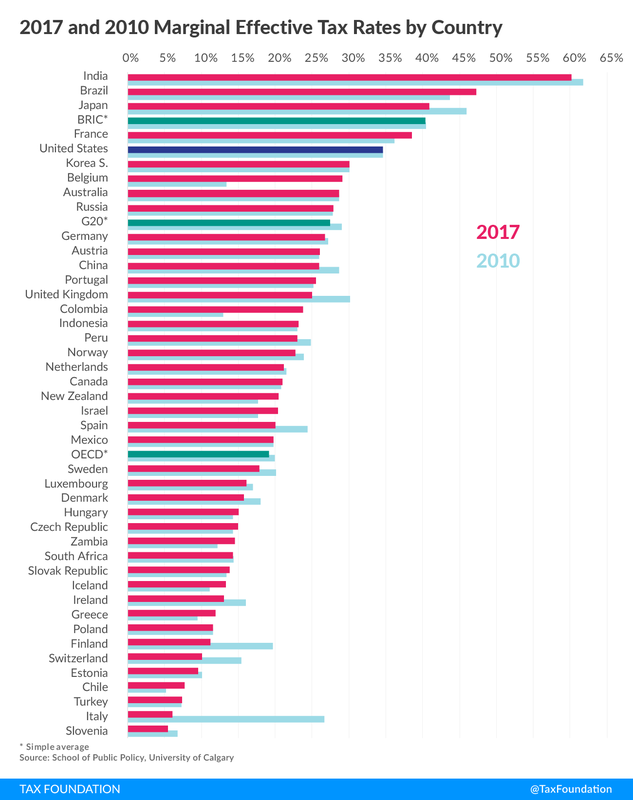 Organization of Economic Cooperation and Development, 2017, https://data.oecd.org/tax/tax-on-corporate-profits.htm. B. Dahlby, Marginal Cost of Public Funds: Theory and Applications, MIT Press, Cambridge, Mass., 2008. See K. Clausing, “Profit Shifting and U.S. Corporate Income Tax Policy Reform,” Washington Center for Equitable Growth, 2016, http://equitablegrowth.org/report/profit-shifting-and-u-s-corporate-tax-policy-reform/. See K. Hassett and A. Mathur, “A Spatial Model of Corporate Tax Incidence,” Applied Economics, 47:13, 1350-1365, 2014; Liu, L. and R. Altshuler, “Measuring The Burden Of The Corporate Income Tax Under Imperfect Competition,” National Tax Journal, National Tax Association, 66(1), 215-37, 2013; and W. G. Randolph, “International Burdens of the Corporate Income Tax,” Congressional Budget Office Working Paper No. 09, 2006. In the model, a manufacturing company would choose expensing on a prospective basis. Dr. Mintz is currently the President’s Fellow at the University of Calgary’s School of Public Policy focusing on tax, urban and financial market regulatory policy programs. Philip Bazel is a former research assistant at the University of Calgary’s School of Public Policy and has co-authored several papers with Dr. Jack Mintz on tax and economic policy.